The Assad regime has warned the United Nations Security Council that deliveries of aid across its borders into insurgent-held areas without its consent is an “attack”. The message, delivered by Syrian Ambassador Bashar al-Jaafari in a letter in the name of Arab and Syrian lawyers on Wednesday, suggests that Damascus reserves the right to strike convoys. The Syrian military has maintained months-long sieges on many insurgent-held towns and villages in what the opposition has called a “surrender or starve” policy. The UN said last month that, because of Damascus’s blocking of deliveries, 75% of food and 85% of medicine go to regime-held areas. On February 22, the Security Council passed a resolution mandating all sides to allow aid, but Russian objections ensured there was no clause for enforcement. The sole purpose of the initiative is to use United Nations auspices for the delivery of logistical backing to the terrorists. 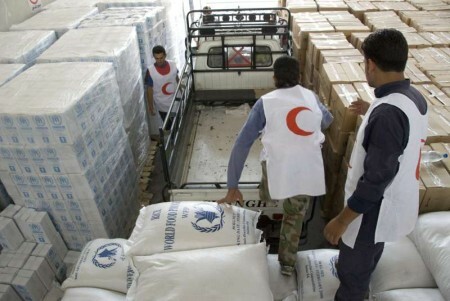 Importing aid in coordination with terrorist organizations and without consultation with the Syrian state would amount to an attack on the Syrian state and on its territorial integrity and political independence. Secretary-General Ban Ki-moon told the Security Council on Friday that the UN was ready to put in place “speedy, pragmatic and practical arrangements at critical border crossings”. Russia said on Tuesday that it has the Assad regime’s approval of a resolution to open four border crossings under a “far-reaching formula”, without specifying details. Australian Ambassador Gary Quinlan said on Thursday that the proposal “is not good enough” yet. The United Nations says that the number of Syrians needing assistance is now 10.8 million — nearly half the country’s pre-conflict population. In addition, more than 2.8 million Syrians are refugees outside the country. Secretary General Ban Ki-Moon said in his report to the UN Security Council that 4.7 million Syrians are now in areas that are “difficult or impossible” for humanitarian workers to reach, an increase frmo 3.5 million in the previous estimate. President Obama has said that effective armament of insurgents in the near-future is a “fantasy”.